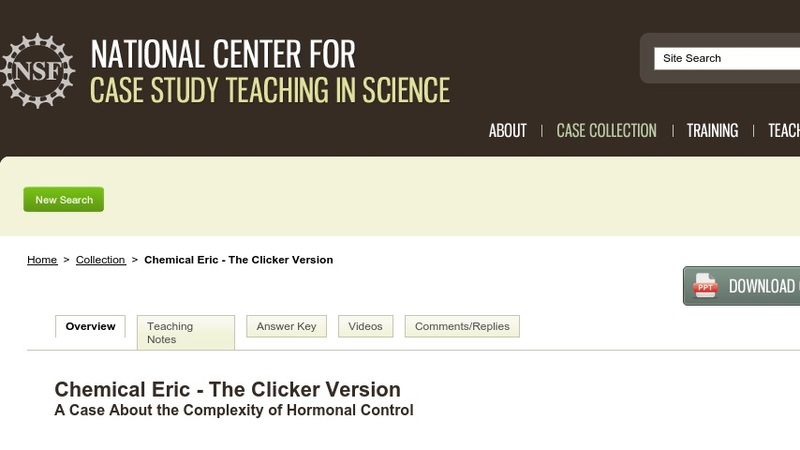 This “clicker case” is a modified version of a case originally published in the National Center for Case Study Teaching in Science case collection in 2006, “Chemical Eric: Dealing with the Disintegration of Central Control,” by the same author. The case is designed to teach introductory biology majors about the role of the pituitary in controlling hormones. It presents an actual case in which the pituitary is seriously disrupted. By examining the various effects of pituitary disruption and tracing them back to their hormonal causes, students gain an understanding of the role of the pituitary in controlling a variety of hormones and in the cascade of effects triggered by high-level pituitary hormones. The case is formatted as a PowerPoint presentation (~7.7MB) punctuated by questions that students answer in class using personal response systems (“clickers”). The case could be used with slight modifications in a human physiology class or a more advanced animal systems course.